German delaying action across the whole of Italy stubbornly slowed the Fifth and Eighth Army advances during late October and early November. Italy's mountains lay in the path, one after the other. The Germans skillfully bargaining for time, made each a hard-fought objective to win. Chill and rain marked the seasonal change in weather. Nevertheless, optimism still flowed in the expectations of many that Rome would be reached before long, even "before Christmas." But Rome never looked so far away as it did from the base of Maggiore or Sammucro, with Germans peering down from the top. It rained the November night the 36th moved up to re-enter the line near Mignano, where Highway 6 and a main railway cut through a narrow pass into the Liri Valley running north toward Rome. Elements of the 3rd Infantry Division invited relief from their cold, rock-ledge holdings on the slopes of the mountains flanking the pass. Of the battles and of the winter months that were ahead, General Walker upon their conclusion could forthrightly state, "I do not recall any campaign in the whole history of the United States Army in which soldiers have had to endure greater hardships or have performed greater deeds of heroism than this campaign in Italy." 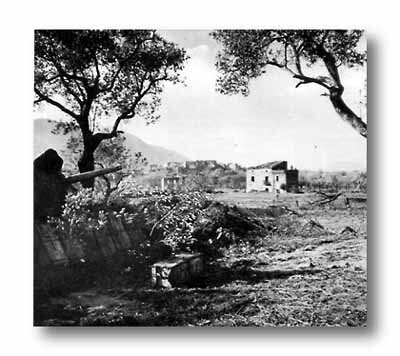 A tank destoyer gun points over Mingano toward Liri Valley. Mt. Maggiore can be seen on the left.